EL PASO, Texas » Hal Mumme's direction to his quarterbacks coach, Matt Mumme, was to the point. "Go find us an athlete who wants to be a dropback passer," Mumme told his son three years ago. Where: Aggie Memorial Stadium, Las Cruces, N.M.
TV: Pay-per-view live on Oceanic PPV 255, with replay at 6 p.m.; free replay, KFVE (Ch. 5) tomorrow, 9:30 p.m. and Sunday, 10 a.m.
Matt came back to Southeastern Louisiana with a big guy who was being recruited as a tight end by Division I schools. About a year later, June Jones was watching tape of junior-college receiver Jerard Rabb when he noticed something strange. Every pass was on the money. In need of a replacement for Tim Chang, Jones naturally became curious about who was throwing the balls to Rabb. Chase Holbrook and Colt Brennan were raw unknowns then, but Mumme and Jones had an idea of what they could become. Today, Holbrook of Mumme's New Mexico State team and Brennan of Jones' Hawaii squad are at the top of the national lists in several quarterbacking categories. Holbrook is No. 1 in total offense (409.7 yards per game) and passing (429.5), with Brennan No. 2 in total offense (395.7) and passing (378.5). Brennan leads in touchdown passes with 23. And, because of those numbers, the Warriors (4-2, 2-1 WAC) lead the nation in total offense, and the Aggies (2-4, 0-2) lead in passing. They meet tomorrow at Las Cruces, N.M., in a game that may well feature more than 100 passes and 100 points. Neither player was heavily sought after by Division I schools out of high school to play quarterback. Now Sports Illustrated has them both ranked in its top 15 at the position among the current college crop (Brennan is 11th and Holbrook is 12th). It's Holbrook's third year in Mumme's offense (but first as a starter), which has put up big numbers everywhere, including at Kentucky. "He makes good decisions and he's very passionate about the game and loves our style," Mumme said. While Brennan and Holbrook operate similar pass-first offenses, they do have differences. Brennan is a better runner, but Holbrook is taller and heavier. "I caught him on film," Holbrook said. "We're different. He's a mobile guy, he makes things happen with his feet as well as his arm. He's real accurate." Las Cruces-Sun News sports editor Geoff Grammer said Holbrook is extremely poised for a sophomore. "The other players really like him. They voted him as a team captain before he even played a down," Grammer said. "He's a quiet, serious guy who's able to keep everybody else calm. Hal Mumme trusts him so much that he often just calls the formation and lets Chase call the play." Brennan also enjoys a good relationship with his coach. Jones still calls the plays, but he acknowledges that Brennan's understanding of the offense has improved vastly from last season. "I'm really proud of how he's competing," said Jones, after Brennan passed for 409 yards and five touchdowns on 32-of-39 accuracy in UH's 68-37 win at Fresno State last week. "He's getting better every week. It's pretty exciting to watch right now, as a fan and as a coach." Jones continues to be amazed by Brennan's accuracy, and said Holbrook isn't far behind in that area, if at all. "It looks to me Chase is the same way," Jones said. "He understands what Hal wants and is playing very well for him." Brennan said he's excited about tomorrow's matchup with Holbrook, but he's more concerned about letters than numbers. "That's one thing that I couldn't care less about, the stats right now. I'd rather like, I don't care if Chase Holbrook goes off and throws for way more yards and touchdowns than me and we walk away with a W," he said. "One thing that I've learned from last year, Jeff Rowe (of Nevada), and this year, Jared Zabransky (of Boise State), those guys got recognized for the wins that they get. So that's the important thing," Brennan added. "Their quarterback is going to have a big day. He's going to come out and complete passes, complete touchdown passes probably. And we've got to be able to counteract that." Mumme said he's impressed with Brennan. "He wore us out last year (with a personal-record seven touchdown passes). He's got a terrific arm," Mumme said. "He moves around. He's hard to get a sack on or pressure on." Holbrook said there was no question he would join Mumme in Las Cruces. "I knew he might leave one day and I might go. 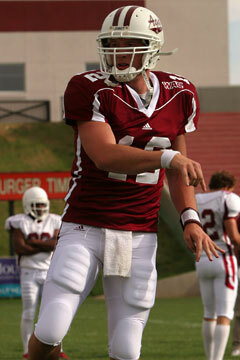 The offense is a good fit for me," said Holbrook, who sat out last season as a transfer while the Aggies went 0-12. "That year off I got to watch a lot of things happen and learn from them." NMSU managed to stay fairly close against unbeaten Boise State last Sunday before falling 40-28. "We did a good job recruiting and in the spring and the summer we did a lot to get our timing down," Holbrook said. "I think it will be an exciting game (against UH). It shouldn't be too long. Both teams like to control the clock and the game with short passes." Mauia ready: Second-team running back Reagan Mauia appears ready to play after sitting out against Fresno State last week. Mauia has been bothered by a shoulder injury since the start of the season. He also rested it against Eastern Illinois on Sept. 30. On deck: Sophomore walk-on Guyton Galdeira earned a game ball last week for his play on special teams. Tomorrow, he could also play a big role in the secondary. "He's the first man off the bench at corner," UH defensive backs coach Rich Miano said. Short yardage: Sophomore second-team defensive end Fale Laeli is expected to play in two more weeks. He hasn't been in since suffering a knee injury Sept. 23 at Boise State. ... NMSU safety Gill Byrd II is the son of former NFL great Gill Byrd. ... The Warriors practiced last night at Eastwood High School in El Paso. A brief scuffle between two players during team drills was broken up by offensive line and special teams assistant Dennis McKnight.